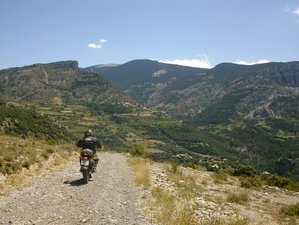 Experience fantastic off-road riding around Province of Barcelona on this 2 days of motorcycle tour in Spain. You will ride through different places every day from and back to your base that is located to 15 kilometers south of Barcelona. Enjoy the unforgettable ride through beautiful places of Barcelona with the promise of panoramic views of incredible landscapes! Join this tour and prepare to be amazed by all the wonders that await you in the breathtaking Barcelona. During this tour, you will stay at Hotel Calasanz in Molins de Rei, Spain. You will experience fantastic off-road excursions around Barcelona. During this tour, you will depart to the regions of Bages, Osona, Moianes, Penedes, and more. You will ride through all types of forest tracks but the tours are always adapted to all levels of driving, although it is always better to have some experience. You will leave and return to the starting point. On the itineraries, you will see vineyards, lush forests, beautiful mountains, and charming landscapes. You will not miss the local gastronomy which is very important on the tour! This tour will take place in Spain, going through several places in the Province of Barcelona including Bages, Osona, Moianes, Penedes, and more. You will be served typical food in a rural area.